Swimming pools are a great way to improve your outdoor space and entertain friends and family. For many of us, those friends and family members often include pets. If you're planning on having animals near your pool, be sure to consider these safety precautions. While you may want to let your dog jump in the pool and go for a swim, be sure to keep your guests in mind. When animals are in the water, you'll need to deal with pet hair, along with more dirt and debris than normal. Keeping the pool in good shape starts with installing the right filter that will keep the water clean and sanitized. Choose a filter with a large capacity able to handle the increase in debris. Start by making sure your pet is comfortable with water, as well as able to get out of the pool without help. Always supervise pet pool time to avoid accidents. Keep in mind that not every dog will be ready and willing to jump in a pool. Gauge your pet's comfort level and help him get used to the water. 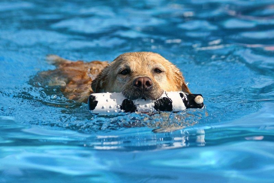 Just like humans, pets are affected by pool water and chemicals. Give your pet a quick rinse after being in the pool, to prevent rashes, irritation, and dry skin. Be on the lookout for other issues too, like red eyes and more scratching than usual, which are signs the pool water is causing irritation. Along with pet safety comes keeping humans safe while swimming with animals. The most basic step you can take is simply looking at your pool and evaluating it. The water should be clear rather than cloudy, and free of debris. Get the pool in shape before letting anyone go for a swim. When inviting others to your pool, be sure they're comfortable with being in the water with animals. Especially when kids are in the pool with pets, make sure they know to tell an adult as soon as there's an issue. If anyone gets scratched, they'll need to get out of the water to prevent infection. There will be times when you'll find it's much easier to keep pets contained, rather than letting them jump in the water. Exterior ZipRite shades are a great solution. The shades lock into a track, securely sealing the area. Give your pets their own space without worrying about them getting out. For more information and a free in-home consultation, contact Polar Shades at 702-260-6110 today and schedule your free in-home consultation.